Puerto Rican Obituary is a very-long poem written by Pedro Pietri, a Puerto Rican who entered the U.S military. He was born in Puerto Rico in 1944 and raised in Harlem. He was drafted to the army after he graduated from high school. He served in Vietnam and returned tothe United States as a fierce opponent of that war and the system that spawnedit. He said that it was not Vietcong who was the enemy, but the mercenaries who invaded their country. He was an activist of The Young Lords, which is acommunity activists supporting demands for fair and affordable housing anddecent health care and running free breakfast for children. The Young Lordswere destroyed by U.S. government provocations in the mid-1970s, but PedroPietri continued on as radical activist and poet –he saw no distinction between these two roles. Most notably he helped to found and sustain the Nuyorican Poets Café, an acclaimed center for oppositional arts and literature. 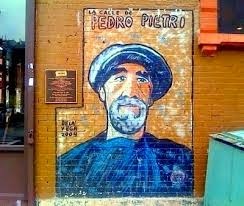 Pedro Pietri read Puerto Rican Obituary for the first time in 1969 at a rally in support of the Young Lords Party. The poem is very deep and meaningful. Its power, insight, and message continue to resonate among activists and dreamers all over the world. As the New York Times put it recently “three decades ago, a poem ignited a movement”. Puerto Rican Obituary’s subject is allabout Puerto Rican immigrants, never-ending dreams, struggle, inferiority, and search for a better life. Its theme is “Puerto Rican immigrants who came to theU.S. trying to chase American Dream but then it does not work out, because American Dream is for white Americans, not for Hispanics, Asians, or else”.Puerto Ricans come to the Uncle Sam country hoping to get a better life as whatthey hear from people that America is a paradise. Instead of being in aparadise, they become inferior. They dedicate their life for work. However, itfeels like their work does not make any chance to their prosperity. Still, theyare broke, owing, and poor. They have so many dreams but they gave it all uprealizing that they were born to be poor. Then, they become pessimistic, obedient and submissive to their bosses. They depend their lives on their bosses, not hoping to have a higher position because their hopes, dreams, andspirits have died. This poem has the topic of Puerto Rican culture, which is national identity. Basically, Puerto Ricans who moved to New York during the big wave that began in the mid 1960’s followed the wrong dreams. They were fed by the Americanization thinking that living in America would make their lives easier and more prosperous. However, it did not turn outthat way. They get jobs with low salaries, and experience racial treatment.They traveled all the way from Puerto Rico to America just to live the life oflow-positioned labors. However, although they live a life of poor inferiors,they still have the pride to say that they are Puerto Ricans who become Americans. They follow the hegemony saying that the status of being Americansis more prestigious than the status of being Puerto Ricans. So, whenever they write to their families in their home country, they can proudly say that America is wonderful and they are happy to be its citizens. Although in the fact, it is vice versa. They are happier to be far from home and poor, than tobe in their home country and rich. This is the hegemony that they grasptightly. Puerto Rican immigrants are dreamers but resistance to act. They dream to have a lot of money, to own ahouse, to buy these and that, just like what white Americans do, but realizingthat they are nothing more than immigrants, they give it all up. They believethat their faith is to be miserable. On the television, reality shows picturean ideal American family, with black maids and Latino janitors. Andunfortunately, Puerto Rican immigrants take those television shows seriously. By seeing those, they are made to more believe that they were born to bejanitors of American families and do not have the chance to reach AmericanDream, which was basically the reason they moved to America. They want theirlife to change, but do not take any action. They only hope for their bosses togive them prosperity, but do not try to struggle for it. They prefer to get prosperity in a fast way, than fight for it. The craziest thing they do iscoming to fortune card dealer to see their future and ask for a better life.They also practice religion without real intentions because they practice it to please their bosses. They do whatever makes their bosses pleased, including practicing religion. Puerto Rican immigrants like to compete and hate each other. They steal each other in order to get what theycannot get. If someone has something they cannot get, they will hate him for it. They also feel miserable because they have to speak a strange language thatis English. They have to open the dictionary whenever they communicate with other people around them. However, they have to bear it because of the pride of being Americans, which is, for them, better than being Puerto Ricans. The conclusion of this poem is that Puerto Rican immigrants come to America with the dreams of having a betterlife, but once they get there, they are reluctant to take the actions. It is because they believe that they are meant to be poor and inferior. So, they just wait for a miracle to change their destiny. Meanwhile, in fact, there will beno change with their lives if they do not take any action. As the result, they live an empty life with the dreams of dead spirits and they steal each other among Puerto Rican immigrants. The real example of this poem isthe Hispanic immigrants from Puerto Rico that came to America in 1960s. They migratedto seek an opportunity as well as start a new life. This condition does not happen only in America, but also in Indonesia. People from small towns in Indonesia think that the life in Jakarta is easy, that it is easy to get a job there. Many of them move to Jakarta without any significant skills and hope to have a better opportunity. In fact, the life there is very hard. People who cannot compete will get defeated. They will also become inferior because thesocial status they bring from their hometowns is different with the people originally from Jakarta. This condition is the same with what Puerto Rican immigrants feel when they migrate to America.